Since then, despite searches and forensic investigation, no evidence has been found to establish what befell the three crew. "There is absolutely no evidence to suggest that violence or foul play were involved," said Chief Superintendent Roy Wall, who commanded the sea and air search from Townsville. "Something — we don't know what — went badly amiss." Initial post, with links to updates, here. Commander Salamander's Fullbore Friday on a troop carrier's career. Steeljaw Scribe Flight Deck Friday on the Phantom I. The United Nations World Food Programme (WFP) today increased the number of people it aims to feed in Somalia this year to 1.2 million and appealed for urgent contributions of US$22.4 million to avoid a looming break in food supplies. The rise to 1.2 million people, an increase of 200,000 over previous estimates, is the result of a dramatic deterioration in the Lower and Middle Shabelle regions of southern Somalia. Long viewed as the country's 'breadbasket', the area has recently suffered a variety of shocks - below normal or long rains that ended in June, rising inflation, an influx of displaced people, insecurity, trade disruptions and worsening health conditions. "The Shabelle regions usually export food to other regions, but this year they cannot feed themselves so the most vulnerable require our help," said WFP Somalia Country Director Peter Goossens. "Also, families driven from Mogadishu by fighting need food for the coming months." The top 10 donors to WFP's two-year Protracted Relief and Recovery Operation in Somalia ending in July 2008 are: the United States (US$23 million), Canada (US$7.8 million), Netherlands (US$6.8 million), Saudi Arabia (US$3.3 million), Japan (US$3.2 million), multilateral funds (US$2.2 million), Germany (US$2 million), Finland (US$1.9 million), Ireland (US$1.7 million) and Switzerland (US$730,000). Floods have destroyed at least 4,000 hectares of farmland in southern Somalia's Middle Shabelle region, affecting 12,000 people, local officials said. The damage occurred around the town of Jowhar, the regional capital, where the Shabelle River burst its banks last week. "Some of the villagers were about to harvest [crops] when the river broke its banks," Usman Haji Abdullahi Aqil, Jowhar district commissioner, told IRIN on 29 August. "Some 2,050 families [about 12,000 people] were affected and lost their crops." He said residents of the area have had poor harvests during the past two years and were expecting 2007 to be a good year. "Now everything is lost and we have to appeal for help," said Aqil. The situation was exacerbated by the fact that since the collapse of Somalia's national government in 1991, nobody has been able "to desilt the riverbed or manage the sluice gates on the rivers or adjoining canals", according to the district commissioner. Other local sources said farmers had also eroded the river bank in an effort to irrigate their fields. Foreign aid donors are reluctant to help, because Somali pirates attack ships carrying food and other aid, demanding ransom for hijacked ships and crews. Bringing food in by truck from Kenya is much more expensive. Not just because trucks are more expensive to operate than ships, but because of the dozens of roadblocks established by warlords and bandits, demanding a bribe from the truck driver, or taking part of the cargo. Foreign countries with warships off the coast are reluctant to get involved suppressing the pirates. Because to really do that you have to go ashore and control the coastal villages the pirates come from. "You attack it, you own it" seems to be the rule, and no one wants to get involved in Somalia. • Hurricane Katrina Search and rescue operations alone saved 24,135 lives from imminent danger, usually off the roofs of the victims’ homes as flood waters lapped at their feet. Coast Guardsmen “evacuated to safety” 9,409 patients from local hospitals. In total, 33,545 souls were saved. Seventy-six Coast Guard and Coast Guard Auxiliary aircraft took part in the rescues. They flew 1,817 sorties with a total flight time of 4,291.3 hours in the air. The air crews saved 12,535. A total of 42 cutters and 131 small boats also participated, with their crews rescuing 21,200. Over 5,000 Coast Guardsmen served in Katrina operations. • Prinsendam Rescue A fire broke out on the Dutch cruise vessel Prinsendam off Ketchikan, Alaska on 4 October 1980. The Prinsendam was 130 miles from the nearest airstrip. The cruise ship’s captain ordered the ship abandoned and the passengers, many elderly, left the ship in the lifeboats. Coast Guard and Canadian helicopters and the cutters Boutwell, Mellon, and Woodrush responded in concert with other vessels in the area. The passenger vessel later capsized and sank. The rescue is particularly important because of the distance traveled by the rescuers, the coordination of independent organizations and the fact that all 520 passengers and crew and crew were rescued without loss of life or serious injury. • Pendleton Rescue On 18 February 1952 during a severe "nor’easter" off the New England coast, the T-2 tankers SS Fort Mercer and SS Pendleton broke in half. BM1 Bernard C. Webber, coxswain of motor lifeboat CG-36500, from Station Chatham, Massachusetts, and his crew of three rescued the crew of the stricken tanker Pendleton, which had broken in half. Webber maneuvered the 36-footer under the Pendleton's stern with expert skill as the tanker's crew, trapped in the stern section, abandoned the remains of their ship on a Jacobs’s ladder. One by one, the men jumped into the water and then were pulled into the lifeboat. Webber and his crew saved 33 of the 34 Pendleton crewmen. Webber and entire crew were awarded the Gold Lifesaving Medal for their heroic actions. In all, U .S. Coast Guard vessels, aircraft, and lifeboat stations, working under severe winter conditions, rescued and removed 62 persons from the foundering ships or from the water with a loss of only five lives. Five Coast Guardsmen earned the Gold Lifesaving Medal, four earned the Silver Lifesaving Medal, and 15 earned the Coast Guard Commendation Medal. • Dorchester Rescue On 3 February 1943 the torpedoing of the transport Dorchester off the coast of Greenland saw cutters Comanche and Escanaba respond. The frigid water gave the survivors only minutes to live in the cold North Atlantic. With this in mind, the crew of Escanaba used a new rescue technique when pulling survivors from the water. This "retriever" technique used swimmers clad in wet suits to swim to victims in the water and secure a line to them so they could be hauled onto the ship. Escanaba saved 133 men (one died later) and Comanche saved 97. • Joshua James and the Hull (MA) Life Saving Station (25-26 November 1888) Over the two day period Keeper Joshua James and his crew by their zealous and unswerving work rescued some twenty-eight people from five different vessels during a great storm. In addition to the number of individuals rescued, the number of vessels involved, the weather conditions, and the duration of their efforts, James and his crew conducted differing types of rescues which included the employment of the beach apparatus and rescue by boat. For their versatility, endurance, skill, and dedication, James and his crew were awarded the Gold Lifesaving Medal. • The Priscilla Rescue On 18 August 1899, Surfman Rasmus S. Midgett, from the Gull Shoal Life-Saving Station (NC), was conducting a beach patrol on horseback and came upon the barkentine, Priscilla, which had run aground. Given his distance from the station, he determined to do what he could alone. Immediately, he ran as close to the wreck as he could and shouted instructions for the men to jump overboard one at a time as the waves receded. Obeying his instructions, the sailors leapt overboard. Midgett, seized each man and dragged him from the pursuing waves safely to the beach. In this manner, he rescued seven men. There were still three men on board who were too weak to get off the vessel. Midgett went into the water and carried each of them to the beach. For the ten lives he saved, Midgett was subsequently awarded a Gold Lifesaving Medal. • Keeper George N. Gray and the Charlotte (NY) Life Saving Station (14-15 December 1902) The crew received the Gold Lifesaving Medal in recognition of their rescue of 4 men and 1 woman from the wreck of the schooner John R. Noyes. They were engaged for more than a day and a night with little sleep, having been under oars from 11:30 PM of the 14th to 4:30 PM. of the 15th with the exception of about two hours. They pulled in a heavy seaway for nearly 60 miles and all were covered in ice and were frostbitten. In addition to the conditions and distances rowed, the keeper commandeered a train and sleds to move the beach cart and equipment through the deep snow drifts for the launching of the surfboat. • Overland Rescue In 1897, eight whaling ships were trapped in the Arctic ice near Point Barrow, Alaska. Concerned that the 265 crewmen would starve during the winter, the whaling companies appealed to President William McKinley to send a relief expedition. USRC Bear sailed northward from Port Townsend, Washington in late November 1897. With no chance of the cutter pushing through the ice to Point Barrow, it was decided to put a party ashore and have them drive reindeer to Point Barrow. Lieutenant David H. Jarvis was placed in charge. He was joined by fellow officers Lieutenant Ellsworth P. Bertholf and Surgeon Samuel J. Call along with three other men. Using sleds pulled by dogs and reindeer, snowshoes, and skis, the men began the expedition on 16 December. They arrived at Point Barrow, 1,500 miles later, on 29 March 1898. The expedition managed to bring 382 reindeer to the whalers, having lost only 66. For their work, Bertholf, Call, and Jarvis received a gold medal from the United States Congress. • Bermuda Sky Queen Rescue (14 October 1947) The American-owned flying boat Bermuda Sky Queen, carrying sixty-nine passengers was flying from Foynes, Ireland to Gander, Newfoundland. Gale force winds had slowed her progress and she was running low on fuel. Too far from Newfoundland and unable to make it back to Ireland, the captain decided to fly toward the cutter Bibb which was on Ocean Station Charlie in the North Atlantic. The plane’s captain decided to ditch and have his passengers and crew picked up by Bibb. In 30-foot seas, the transfer was both difficult and dangerous. Initially the Bibb’s captain tried to pass a line to the plane which taxied to the lee side of the cutter. A collision with the cutter ended this attempt to save the passengers. With worsening weather, a fifteen man rubber raft and a small boat were deployed from the ship. The raft was guided to the escape door of the aircraft. Passengers jumped into the raft which was then pulled to the boat. After rescuing 47 of the crew, worsening conditions and the approach of darkness forced the rescue’s suspension. By dawn, improved weather allowed the rescue to resume and the remaining passengers and crew were transferred to the Bibb. The rescue made headlines throughout the country and upon their arrival in Boston, Bibb and her crew received a hero’s welcome for having saved all those aboard the ditched Bermuda Sky Queen. • 1937 Mississippi River Flood During the disastrous 1937 Mississippi River flood, the Coast Guard rescued a total of 43,853 persons who they “removed from perilous positions to places of safety". Additionally, they saved 11,313 head of livestock and furnished transportation for 72 persons in need of hospitalization. In all 674 Coast Guardsmen and 128 Coast Guard vessels and boats served in the relief operations. The immense scope of the operations actually eclipsed the number of persons that the Coast Guard rescued during the Hurricane Katrina operations. • Chicamacomico (NC) Lifeboat Station (16 August 1918) On 16 August 1918 the British steamship SS Mirlo, proceeding northward along the Atlantic coast, struck a mine laid by U-117 about 1 mile off the Wimble Shoal buoy, abreast of the Chicamacomico Coast Guard Station. Her cargo of gasoline and refined oil spread over the sea and ignited. This converted the surface into a mass of flame and smoke. The matter of rescuing the crew was rendered extremely difficult owing to the heavy sea, quantities of wreckage everywhere, and the intense heat from the burning vessel and fuel. Despite these difficulties, Boatswain (L) John A. Midgett and the Chicamacomico Station crewmen forced their boat into this mass of fire and wreckage. After heroic efforts they rescued six men found clinging to a capsized boat. Midgett and his men then picked up two more boatloads (36 men) of the Mirlo’s crew and landed them through the heavy surf. The total count of those rescued was 42 persons. For their efforts, Midgett and his crew were each awarded the Gold Lifesaving Medal. • Carl von Paulsen Rescue LCDR Carl von Paulsen set the seaplane Arcturus in a heavy sea in January 1933 off Cape Canaveral and rescued a boy adrift in a skiff. The aircraft sustained so much damage during the open water landing that it could not take off. Ultimately, Arcturus washed onto the beach and all including the boy were saved. He was awarded the Gold Lifesaving Medal for this rescue. The rescue made him famous and he appeared in the "Unsung Heroes" comic book in the mid-1930s. Thanks to all the Coasties! UPDATE (8/31/07): Due to a typing error on my part, the source of the the "Top Ten List" was AWOL from this post - as was the "blockquote" indicator (I guess it helps if you spell things right). In any event, the source of the Top 10 list: Coast Guard Chief of Public Affairs Jim McPherson, identified here, and I think I have fixed the quote thing. My apologies to Mr. McPherson and to the readers of this post. A few posts ago I noted a book review concerning Contemporary Piracy and Maritime Piracy here. Now Galrahn at Information Dissemination has found a link to the Summer 2007 Naval War College Review with an article by the book's author, Martin Murphy, in a downloadable pdf format (Note- you have to download the entire issue) at his post Suppression of Piracy and Maritime Terrorism. Read Galrahn's post and then hit the links. Coastguards in Falmouth, Cornwall, have launched a rescue operation to try to save 59 people abandoned on an inflatable boat off the coast of Libya. An Ethiopian based in the UK appealed to them for help after receiving a call by satellite phone from the boat. A Coastguard spokesman said the group, which includes four pregnant women, were cast adrift after being falsely told they were in Italian waters. They were, in fact, only 64 miles from the north African coast. The group are understood to have left north Africa two days ago, trying to get to Europe. The spokesman said there were 15 women, seven children and 37 men on board. "The craft is taking water and it has no engine," he said. "The weather has worsened, they have no food or water. "They had all their money taken from them." Coastguards located the craft early on Wednesday and were working with both the Italian and Maltese authorities and with the British Embassy in Tripoli to get assistance. Those who are smuggled have consented to be smuggled. Trafficking victims, according to the UNODC, "have either never consented or, if they initially consented, that consent has been rendered meaningless by the coercive, deceptive or abusive actions of the traffickers." Another major difference, according to the UNODC, "is that smuggling ends with the arrival of the migrants at their destination, whereas trafficking involves the ongoing exploitation of the victims in some manner to generate illicit profits for the traffickers." The United Nations' Protocol Against the Smuggling of Migrants by Land, Sea and Air, Supplementing the United Nations Convention Against Transnational Organized Crime defines the "smuggling of migrants" as "the procurement, in order to obtain, directly or indirectly, a financial or other material benefit, of the illegal entry of a person into a State Party of which the person is not a national or permanent resident." Smuggling by sea is not only dangerous for migrants, but is also a highly complex legal area for authorities, since crime at sea falls under international law. In October 1999, the Italian police, navy and coastguard tracked down a boat, which they suspected of smuggling, making its way from Albania to the Italian coastline. In an effort to escape authorities and lighten his load, the helmsman, an Albanian smuggler, threw his human cargo overboard. An estimated 100 migrants--Albanians, Turkish and Iraqi Kurds, Pakistanis and Kosovars--had been hiding in a wooden hold of the boat. Several victims were rescued, but many drowned. Every night Italian officials head for the water, capturing at least one boatload in human cargo, and sometimes even up to 20. While the trade in illegal commodities, such as drugs, cigarettes and weapons, is covered under international agreements, the trade in human cargo at sea and the treatment of victims is an area that is not yet regulated. As a result, a set of separate clauses was included in the Protocol to fight against the smuggling of migrants by sea. * Using clearly marked aircraft and ships identifiable as being on government service in order to take actions at sea in cases of migrant smuggling. Interpol site on human smuggling. The U.S. has a Human Smuggling and Trafficking Center. Exactly how "international law" is applied in such case is something I am researching. UPDATE3: A defense of human smuggling on an abstract level here. I doubt the author would defend the pond scum who left these "smugglees" on the high seas. UPDATE4: Nice look at the issues here. Last year, United States deep-draft seaports and seaport-related businesses generated approximately 8.4 million American jobs and added nearly $2 trillion to the economy... Martin Associates late this month completed an in-depth study into the economic impacts of coastal and Great Lakes ports, examining aspects ranging from jobs and wages to business and tax revenues. Of the 8,397,301 Americans working for ports and port-related industries in 2006, nearly 7 million were employed by firms involved in handling imports and exports, such as retailers, wholesalers, manufacturers, distributors and logistics companies. 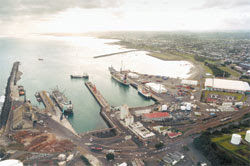 "Compared to the last study we developed in 2000 (based upon 1999 data), these figures indicate a significant increase in the financial benefits that the port industry provides the American economy," said Dr. John C. Martin, president of Martin Associates, "This new report shows that port-related activities are contributing to the economy in record numbers." It is not clear in my initial review of the piece that the impact of the fishing industry or pleasure boating was included in the study. 5.08.2007: 0300 UTC: Conakry anchorage, Guinea. About 30 robbers armed with guns boarded a chemical tanker. Crew locked all access to ship and attempted to contact local authorities for help but failed to get any response. Robbers later left the ship. Nothing stolen and no harm to crew/ ship. Ship weighed anchor and proceeded to high seas for safety. 24.08.2007: 0055 LT: 03:55.3N – 098:46.56E: Belawan anchorage, Indonesia. A product tanker at anchor, waiting to berth, maintained an anti piracy watch on the forecastle, main deck and poop deck. The ABs on the main deck and poop heard the AB on the forecastle shouting. They alerted the bridge on radio. The D/O tried to contact him but there was no response. The alarm was raised and the crew alerted. A through search was carried out for the AB but he was not found. Local authorities informed. 23.08.2007: 0555 UTC: 00:58N - 050:48E, Somalia. A container ship, underway, spotted a suspected pirate boat at a range of 10 nm. The boat suddenly increased speed and headed for the ship. The ship increased speed and took evasive manoeuvres to maintain a CPA of not less than 5 nm with the boat. The suspected boat pursued the ship for around two and a half hours before giving up the pursuit. 1. SOMALIA: Cargo vessel (DANICA WHITE) hijacked likely on 01 Jun at an estimated distance of 205 NM off the central east coast of Somalia. The U.S. dock landing ship (CARTER HALL) had been on patrol in international waters under operational control of Combined Task Force 150 when it encountered the (DANICA WHITE) on 02 Jun. No distress call had been received by Coalition forces but it quickly became clear to the sailors aboard the (CARTER HALL) that the vessel was under pirate control. The Carter Hall crew fired machine gun bursts, first as warning shots and then disabling shots nearly destroying the three small pirate skiffs in tow behind the hijacked vessel. 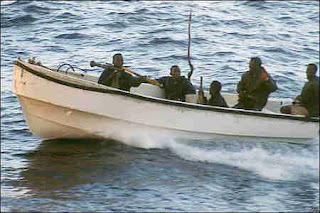 The pirates, hiding behind hostages as human shields, forced the vessel into Somali territorial waters where the Coalition warship could not enter due to rules of engagement. The Danish flagged vessel was carrying building and construction materials to Mombasa from Dubai with a crew of five Danish nationals. The vessel is believed to be anchored in the vicinity of five other hijacked vessels being held for ransom between Harardere and Hobiyo, Somalia. ONI COMMENT: Based on extrapolations of estimated time-distance variables, ONI assesses the hijacking likely occurred in the vicinity of 01:50N 050:02E sometime in the afternoon on 01 Jun. This location is approximately 70NM NE of the reported attack locations on the (IBN YOUNUS), (MUVUNO I) and (MAVUNO II). 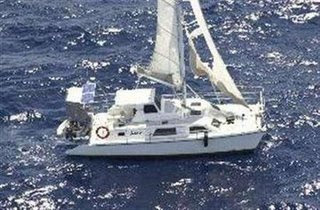 Cargo vessel (DANICA WHITE) has reportedly been released on or about 23 Aug 07, after a ransom demanded by pirates has been paid. The vessel is currently underway to Djibouti (about three days away), escorted by the French corvette (BLAISON). Where upon arrival, the crew will fly from out to be reunited with their families. There has been no confirmation on the ransom amount paid however, according to Danish TV2 News, it reports that a ransom of US$1.5 million (Note by Eagle1: I have it on reliable authority that the paid ransom was substantially less than that) has been paid to the pirates for the release of the ship and five crew (ONI, Navy Times, IMB, CNN, FOX, REUTERS). Aug 07, around 0200 local time, off Manalkadu coast, Point Pedro. An LTTE boat fixed with an eight Horse Power Out-Board Motor was observed by a Navy patrol craft. When the patrol craft moved in to investigate, the LTTE boat fired at the craft. The Navy retaliated taking the LTTE boat into custody. In addition to a body with a cyanide capsule, the Navy recovered a 40mm Grenade Launcher with nine rounds, a GPS and two SMG magazines (LM: Daily News, Ministry of Defence). senior cadres in the intense sea battle (LM: Times of India, The Hindu). Five Danish seafarers abducted by Somali pirates two months ago arrived safely in Djibouti on Tuesday and were all in good health, a Western official said. A ransom was reportedly paid last week for the safe return of the MV Danica's crew, who had been transporting building materials from Dubai to Kenya when they were seized off Somalia in the world's most dangerous waterway. "The Danish crew have arrived in Djibouti and are in good health. They plan to leave tonight," said the Western official, who is not authorised (? )to speak to the media. 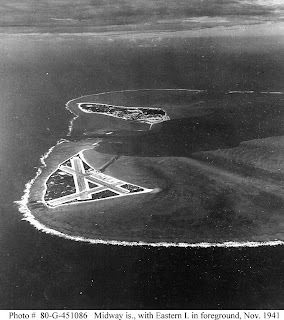 1867 - Captain William Reynolds of Lackawanna raises U.S. flag over Midway Island and took formal possession of these islands for the United States. 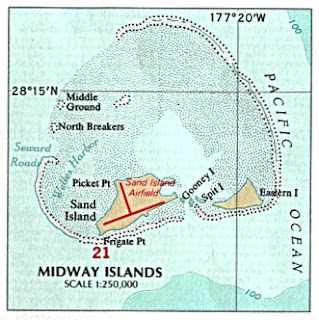 As noted here, one of the attractions of Midway was its potential use as a "coaling station:"
Midway was discovered July 8, 1859, by Captain N.C. Brooks of the Hawaiian barque Gambia, and by him called Middlebrook Islands. An account of this discovery, reprinted from the Polynesian of August 13, 1859, appears in the Paradise of the Pacific for October, 1936 on page 23. Captain Brooks took possession of the two islands in the name of the United States, a peculiar proceeding in view of the flag of his vessel, owned by B.F. Snow of Honolulu. Had he given the editors of the Polynesian a less glowing account of the new discovery, we would be inclined to believe the story that Captain Brooks kept the discovery secret so that he might sell the information to the North Pacific Mail and Steamship Company, who were on the lookout for a mid-Pacific coal depot for the vessels on the oriental run. "It is exceedingly gratifying to me to have been thus concerned in taking possession of the first island ever added to the dominion of the United States beyond our shores, and I sincerely hope that this will by no means be the last of our insular annexations. I ventured to name the only harbour at this island after the present Honourable Secretary of the Navy (Welles), and to call its roadstead after the present Honourable Secretary of State (Seward)." In 1870 the United States Congress appropriated $50,000 to be spent in blasting a 600-foot wide ship channel through the reef into the lagoon, doubtless at the insistence of the Pacific Mail Steamship Co., and based on observations made by the Lackawanna. The U.S.S. Saginaw was detailed to carry the divers and equipment to Midway, arriving there on March 24, 1870. Dredging operations proceeded during the summer of 1870, but weather was so bad that at the end of the seven months little had been accomplished, the funds were nearly exhausted, and the project had to be given up. The need for coaling stations was driven by the adoption of steam propulsion for ships, as touched on here. Midway, of course, was the focus of the great WWII sea battle - Battle of Midway, which may have been the turning point of the war in the Pacific. On the map of the Hawaiian Island chain, Wake is off to the left, circled in red. 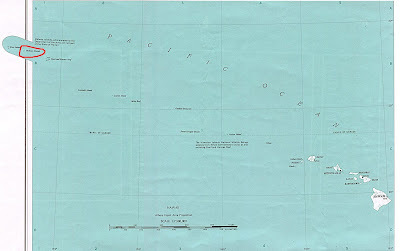 As noted on the map (which can be enlarged by clicking on them, "Midway Island.. are not part of the State of Hawaii") though it is now administered by the Department of the Interior. The threat to sea lanes and lines of communication, commerce and crude oil is more real than ever before. What the Royal Navy alone could have done in the 20th century can no longer be resorted to by even the American navy. Today’s navies need to pool their expertise and resources to deal with the common threat from terrorists and fundamentalists. The Indian navy is on the right track, politically motivated protests notwithstanding. A land-fixated elephant can never understand the depth and the dangers of the sheet of water that constitutes two-thirds of the earth’s surface. he IAF is formulating a new war doctrine in tune with its objective to transform the force into a true aerospace power with "potent strategic reach" spreading from the Persian Gulf right up to Malacca Strait. A "select" team of officers, led by IAF chief Air Chief Marshal Fali Homi Major, had already prepared a "first draft" of this new airpower doctrine. "It will undergo a few revisions before it is finalised," said a source. "The SOPs (standard operating procedures) and 'flying orders' for the entire IAF will follow from the new doctrine, which will also dwell upon the application of military power," he added. The doctrine will revolve around the primacy of airpower in "shaping" or "customising" the battlefield in such a way that the Army, as also the Navy, can carry out its designated tasks. The world's fourth largest air force after US, Russia and China, the IAF visualises itself as "a global player" in the years ahead. 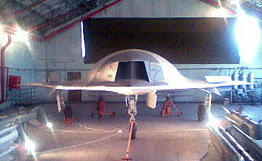 Eventually, it hopes to become "an expeditionary force" on the lines of US air force, with the capability to rapidly deploy and operate across the globe. The doctrine will also incorporate the lessons learnt in recent wars like the US-led attacks in Afghanistan and Iraq, which saw "smart bombs" like high-accuracy JDAMs (joint direct attack munitions) being used in all-weather conditions. B.C. 's coastal transportation systems are wide open to terrorist attacks, and although security checks of B.C. Ferries passengers aren't practical, screening float-plane patrons and bags is, and should be done, Liberal Senator Colin Kenny said Monday during a visit to Victoria. "We can't protect everything all the time," Kenny said during a meeting with the Times Colonist editorial board, explaining that mass transit, like B.C. Ferries, doesn't lend itself to airport-like security - even though the ferry corporation has been the target of past bomb threats, including two this summer. But adding one screening machine and extra security staff to enhance safety on float planes is neither a costly "nor complicated procedure," he said. Liberal Senator Colin Kenny, shown about to board a float plane in Victoria's Inner Harbour on Monday, says it would be easy to improve security on the planes. Underlining what he sees as a very real threat to Victoria's Inner Harbour and Vancouver's ports, especially during the 2010 Olympics, Kenny said: "These aircraft take off fully loaded very close to buildings and there's just zero reaction time." Kenny headed up a Senate committee on national security and defence that in March released a scathing report - a follow-up to a similar dire warning in 2003 - that pointed to grossly inadequate resources assigned to patrolling thousands of kilometres of coastline. The report also suggested float planes be subject to the same passenger and baggage checks as those in larger airports. "What it would mean is instead of checking in 10 minutes ahead of time you'd have to check in 15 minutes ahead," Kenny predicted. But Kenny's logic is lost on Randy Wright, senior vice-president of Harbour Air Seaplanes, who flatly rejects the senator's assessment. "There's a lot bigger targets out there so we don't see the risk," Wright said. "The bigger bang for your buck would be to hit city buses or B.C. Ferries." Photo credit: Flying Penguin of Pacific Spirit Photography (psp@smartt.com) of Burnaby, British Columbia, Canada, distributed under GNU Free Documentation License, Version 1.2 or any later version published by the Free Software Foundation. Administrators of the semi autonomous province of Puntland in northeast Somalia stated that they would never abide by Somalia's parliament debate results over Puntland's oil deals with foreign firms. The regional president, Adde Mussa, told Shabelle that his administration would not accept any results from Somalia's parliament if it would harm Puntalnd's natural resources rights. Two years ago, the Puntland government signed a lucrative deal with Australia's Range Resources, giving the company exploratory rights to minerals and oil reserves in region. The clause in the interim government's oil bill nullifying any post-1990 deals would automatically cancel that deal and others being negotiated. Puntland officials say they are concerned that the bill will divert power and potential wealth away from the region. It just gets better and better in Somalia. Sovereign rights? "Who owns the Malacca Strait?" Indonesia, Malaysia and Singapore are the littoral states of the Malacca Strait, one of the world's busiest shipping lanes. 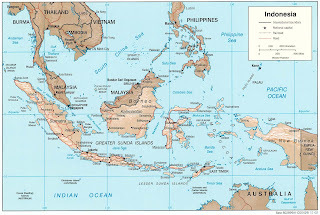 Indonesia controls the majority of the sea lane. Singapore controls the smallest area of the strait, but the city-state enjoys the biggest economic benefit from shipping activities. Indonesia is often cited as the main source of pirates operating in the Malacca Strait. But it is very firm in its position that all three of the countries are fully responsible for security in the strait. However, Indonesia lacks the capacity to exercise its duties because its Navy is smaller and not as well equipped as the navies of Malaysia and Singapore. Other countries -- no matter how vital the security of the strait is for their economies -- can only provide technical assistance to help Indonesia, Malaysia and Singapore ensure safe and secure passage through the 805-kilometer shipping lane. While we fully support the sovereignty of the three countries, we also want to remind them that all stakeholders in the strait have the right to play a role in ensuring the safety of this vital waterway. Major Asian economic powers like Japan and China want more of a role in patrolling the waters, because they depend on the strait for the transportation of commodities like oil and gas. During his summit with President Susilo Bambang Yudhoyono in Jakarta last week, Japanese Prime Minister Shinzo Abe reportedly raised his concerns over security in the Malacca Strait and tried to persuade Yudhoyono to soften Indonesia's opposition to foreign vessels helping to patrol the strait. Indonesia can not simply claim sovereignty and reject any foreign presence in the strait, especially when it remains the main base for pirates there and has so far failed to ensure safe passage through its waters. It is also difficult simply to dismiss whispers overseas -- although there is no evidence --- that rogue elements of the Indonesian Navy turn a blind eye to activities of pirates for a cut of the profit. As long as Indonesia remains unable to play a credible and sustainable role in maintaining security and safety in the Malacca Strait, it will remain difficult for other countries with strong economic and political interests in the waterway simply to entrust Indonesia, Malaysia and Singapore to handle security responsibilities. The three states have every right to maintain their sovereignty over the strait, for their commercial and security interests. They also have the rights to ask for more economic benefits from the foreign parties. But as long as piracy and other security problems remain a concern, it will be nearly impossible for them to continue rejecting the presence of foreign powers in the strait. Indonesia should not be overly rigid in maintaining its territorial sovereignty when a more flexible approach can yield greater benefits, especially in terms of economic advantages and safer passage through the strait for the international community. Blame it on ethanol, gas prices and more demand for grain in China. Ellie Arnold doesn't care about the causes. She just knows her monthly $300 monthly grocery budget is stretched to the max. "That's what I budget at, and we're staying there," she said during a recent shopping trip at a local produce market. "I'm being real careful. Food is the only thing we can cut." Her experience is becoming more common this summer as food prices in just about every category have increased. Meat and dairy products have spiked the most, but processed foods have gotten more expensive because of the corn they contain. Some fruits, vegetables and frozen juices cost more because of bad weather in the growing regions. In the Houston area, grocery prices rose 0.9 percent in July, on the heels of a 0.4 percent increase in June, according to the latest numbers from the Bureau of Labor Statistics. A basket of groceries that cost $100 in July 1984 and $183 a year ago would cost nearly $190 today. Nearly two-thirds of Americans reported paying significantly more per week -- between $8 and $20 -- for groceries, according to a survey by America's Research Group. That's up from 53 percent in February and March. 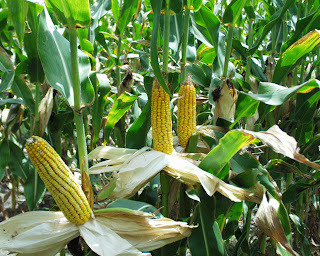 Corn prices have been about $3.50 a bushel, $1.50 more than where it has traded the past couple of years, said Joe Outlaw, co-director of the Agricultural and Food Policy Center at Texas A&M University. Part of the rise in price is increased demand. About 14 percent of the U.S. corn crop is going to produce ethanol as an environmentally-friendly alternative and gasoline supplement. "One of the reasons is ethanol," said Eugenio Aleman, a senior economist at Wells Fargo. "Of course, those who produce ethanol will tell you it's not, but these new uses of corn mean there will be more demand for corn." Higher fuel costs translate to higher food prices because very little food gets eaten in the same part of the world where it is grown, said Aleman. Trucks and ships that move it from the farm to the grocery store need gas to make the delivery. In addition to more corn going to ethanol, growing wealth in China and other developing nations means those countries have more money to buy food. In the wealthy U.S., disposable income goes to luxury items. Countries with smaller household incomes stick to the necessities, Aleman said. "We buy flat-panel TVs," he said. "The Chinese and Indians buy more food." About half of all U.S.-grown corn becomes feed for chicken, pigs and cows, Outlaw said. More demand for meat means more demand for corn. Again, prices rise, and Arnold's grocery budget gets even tighter. One of the ways Arnold said she saves money is by buying raw ingredients and making food, including baked goods, at home. America's addiction to processed food also is dependent on corn. Whether it's corn syrup, cornstarch, dextrose or another byproduct, some type of corn is in nearly every kind of processed food. It serves as a sweetener, a binder, a coater and a filler, among other things. Although the obvious signs point to corn as the main culprit for higher prices at the checkout line, it's not quite that simple, Outlaw said. Usually farmers alternate growing corn one year and soy beans the next. Seeing the growing demand -- and higher prices -- for corn as a fuel source, farmers planted more corn than normal this year, he said. Forecasts call for 13 billion bushels of corn to be harvested, up from less than 11 billion last year. That means the soy bean crop will be smaller, and prices are up to $8.50 a bushel instead of the usual $5, according to Outlaw. Like corn, soy beans are a staple in animal feed. They're also the source for a lot of vegetable oil -- another key ingredient in many processed foods. Again, higher prices for the ingredients and feed translates to higher prices for processed food, dairy products and meat. Aleman and Outlaw tend to agree on the causes of higher food prices, but they're split on how long they'll last. "We have to get used to it," said Aleman. "I don't think we are going to go back down." Outlaw disagrees. The extra supply of corn should push prices back down this fall, as long as flooding, drought or some other disaster doesn't hurt the crop. "If the current corn crop comes in like it's supposed to, corn will drop below $3," he said. Proponents of LNG contend that the gas will stay here. They argue that the Northwest is home to a variety of energy-intensive industries and needs another source of gas to buffer price shocks as supplies from the Rocky Mountains and Canada become constrained. Exports of Canadian gas are expected to decline as its domestic demand heats up for use in separating oil from sands in Alberta. Meanwhile, pipelines are under construction that will carry Rockies gas to East Coast markets, where prices are higher. “In the absence of additional supply, the Northwest will find itself in a very volatile market,” said Joe Desmond, former chairman of the California Energy Commission, who is now a vice president at NorthernStar Natural Gas, which has proposed one of the Columbia facilities, called Bradwood Landing. In a study paid for by NorthernStar, University of Oregon business professor Phillip Romero forecast that the addition of a natural gas terminal would increase regional gas supplies by 20 percent and cause gas prices to fall 13 percent. The economic study is part of a major public-relations offensive that the company has waged in Clatsop County, which is scheduled to rule on the project's proposed zoning changes later this summer. A Bradwood Landing office in downtown Astoria is festooned with the facility's slogan - “Good for the Economy and Good for the Columbia” - as well as a profusion of displays advertising connections to the community, including local schools, Little League teams, 4-H, the North Coast Chapter of Ducks Unlimited, even Clatsop Historical Society. Opponents of the terminals and associated pipelines, ranging from environmental activists to concerned residents, have their own campaign. They describe the projects as tempting terrorist targets and potential environmental disasters and say the projects threaten not only safety and quality of life for residents but also the local tourist trade. They pepper their descriptions of LNG with words such as “blast zone” and “vaporized.” And they contend that while investors have tried to put a friendly local face on their projects, they are really wildcatters from Houston and New York. Good thing the "opponents" aren't trying to use scare tactics. Fred takes all the maritime news over the past week and provides you with links to the highlights as well as some great photos, all for free! Visit Fred Fry International: Maritime Monday 73 and enjoy. See the pretty sailing ships! And you might like to read about a Navy Chaplain who was awarded the Navy Cross and had a ship named after him over at Chaotic Synaptic Activity's Monday Maritime Matters. Bahamas Minister of Maritime Affairs and Labour, Dion Foulkes, said on Wednesday that the “geopolitical” threat of terrorism calls for greater cooperation among nations dedicated to the ideals of freedom and protection of human rights. The Minister said the kind of “random violence” being witnessed in a number of countries as a result of terrorist activities has “truly become” a global phenomenon with blurred lines between combatants and non-combatants. He said while each country must implement measures agreed to by the ISPS Code as mandated by the International Maritime Organization (IMO), it must be realized that The Bahamas faces the additional challenge of being an archipelago – spread over 100,000 square miles of ocean with 24 designated port facilities on four islands. The Northern Limit Line is a demarcation line on the West Sea between South and North Korean waters which was established in August 1953, by the U.N. Army Commander as the U.N. and North Korea failed to produce an agreement on a maritime border, due to differences (U.N. claimed 3 nautical mile while North Korea claimed 12 nautical miles) in the armistice negotiations. Though officially Pyongyang ignored the NLL, declaring "12-nautical mile territorial waters" in March 1955, and then establishing "50-nautical mile military zone," it tacitly recognized the NLL. But when Pyongyang needed to raise tension, the North Korea army violated the NLL deliberately. Especially, after declaring its disapproval of the DMZ in April 1996, their intrusion over the NLL took place more frequently. Recently North Korean navy vessels have broken into the NLL in persuit of on North Korean and Chinese boats fishing south of the NLL. The South Korean government has taken immediate and appropriate action against Pyongyang's violation of the NLL. Key officials of the Unification Ministry came out supporting Minister Lee’s statement on the government’s internet newspaper site on August 22, but Cheong Wa Dae refuses to clarify its position on raising the NLL issue at the summit while just maintaining that the NLL is a virtual maritime border. The two said, “The NLL has preserved the peace and has been a maritime trip wire that prevented conflicts between the two Koreas for more than a half-century,” and warned that yielding the NLL would translate into removing a security shield for the Incheon and metropolitan area. The two added, “The real intention behind the North’s move to abolish the NLL is to neutralize the South’s navy forces around the West Sea that would obstruct its attack against the South in case of a war,” and pointed out, “The claim that yielding the NLL will bring peace on the West Sea is just a fantasy that ignores the North’s military strategy against the South. BBC map of NLL from here. Over the past few months, instances of piracy around the Horn of Africa have shown an alarming increase. There is now a groundswell of opinion in favour of effective action in the form of intensified international efforts to combat the menace. Following the release last week of the Danish-flagged cargo ship Danica White, one such call was issued by the Danish embassy in Nairobi. In a statement published by Fairplay, the international shipping magazine, it said: "The hijacking of Danica White and other vessels off the Somali coast demonstrates that there is a big need for strengthening the international co-operation to combat piracy." But who will bell the cat? The UN can't organize a picnic without some member states stepping up to the plate. The alleged government of Somalia seems unable or unwilling to authorize any action by UN/NATO/Coalition Forces and may not be able to do anything on its own. Pirates who kidnapped two Indonesian sailors in the Malacca Strait earlier this month have released them after a ransom was paid, a global maritime watchdog said Monday. Noel Choong, head of the International Maritime Bureau's piracy reporting center in Kuala Lumpur, said the value of the ransom has not been disclosed, and he declined to identify who paid it. Gun-toting pirates attacked a Malaysian barge on Aug. 13 and abducted the vessel's Indonesian ship master and chief engineer. The pirates did not steal the barge, or any of the steel billets it was carrying from Malaysia's northern state of Penang to Belawan in Indonesia. It was the third pirate attack in the Malacca Strait this year, but the first kidnapping in the busy waterway since July 2005. A couple of days over 164 years ago, the first trans-Atlantic crossing was completed by a U.S. steam-powered ship, the frigate USS Missouri, as noted here. The observations may seem trivial...still they go so far to prove, that in the construction of steam ships, if not superior, we are at least equal to our transatlantic neighbors, who assume to be the ne plus ultra of human greatness, in all their transactions. In naval architecture, generally, the palm of superiority has already been conceded. In 1802 Fulton contracted with Robert Livingston to construct a steamboat for use on the Hudson River; over the next four years he built prototypes in Europe. He returned to New York in 1806. On August 17, 1807, the Clermont, Fulton's first American steamboat, left New York for Albany, thus inaugurating the first commercial steamboat service in the world. Fulton navigated 150 miles of the Hudson River from New York City to Albany in only 32 hours -- the trip had previously taken four days by sailing ship. This event is one of the most important events in the history of navigation. With the power to go up and downstream, the steamboat transformed American rivers into highways. Clermont, named for Livingston's estate in New York, proved to a nation of farmers and craftsmen that the US could compete technologically with Europe. Clermont revolutionized river travel and played an important role in the development of the South. Fulton's Clermont transformed naval warfare, and fostered international relations by facilitating trade and travel across the oceans. Robert Fulton designed the first steam powered paddlewheel warship, which was the first Navy ship to use steam. Fulton called it Demologos, or "The word of the people." But the Navy called it, variously, the Fulton Steam Frigate, the Steam Battery, and Fulton the First. It was originally intended to defend the port of New York during the War of 1812. The Fulton, with her clumsy central wheel, concealed from shot by the double hull, with such thick scantling that none but heavy guns could harm her, and relying for offensive weapons not on a broadside of thirty guns of small calibre, but on two pivotal 100-pounder columbiads, or, perhaps, if necessary, on blows from her hog snout -- the Fulton was the true prototype of the modern steam ironclad, with its few heavy guns and ram. The Fulton was not got into condition to be fought until just as the war ended; had it continued a few months, it is more than probable that the deeds of the Merrimac and the havoc wrought by the Confederate torpedoes would have been forestalled by nearly half a century. As it was, neither of these engines of war attracted much attention. For ten or fifteen years the Fulton was the only war-vessel of her kind in existence, and then her name disappears from the lists. Fulton's idea was to make his vessel invulnerable with a perfectly protected paddlewheel. The first necessity was to protect the propelling arrangements. This he did by having twin hulls, side by side, as in his ferry-boats, with the paddle-wheel in the space between the hulls and protected by an upper deck with bulwarks and stanchions. This deck also sheltered the engine, which was in one hull, and the boiler, which was in the other. What he'd created was a catamaran. It was a hundred and fifty feet long, sixty feet wide, and it had a slot, fourteen feet wide, down its center. During the War of 1812, Robert Fulton proposed to build such 20 steam frigates. Shortly after the War of 1812, the Navy launched Demologos. The "floating steam battery" (steam ship) was designed and launched for the Navy on October 23, 1814. Built by Robert Fulton, it was equipped with 20 guns and could do five knots. She was later rechristened Fulton in honor of the builder of America's first steamboat. 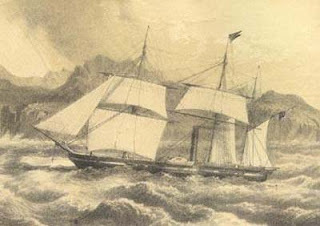 The first Fulton (or Demologos), a catamaran steam frigate, was completed after Robert Fulton's death, and made successful trial runs in the summer of 1815. With the close of the War of 1812, it was decided not to fit her put for service, but she was delivered to the Navy in June 1816. Many old-time Navymen, however, could not picture steam-powered machinery replacing wind and sail. Fulton was later equipped with sails by leaders of the old school and was not very active during her short career. She was used as a receiving ship until June 1829 when her magazine exploded and she was destroyed. Despite Fulton's understandable enthusiasm, the Demologas proved underpowered and poorly designed as a warship. Not until the development of better engines and the screw propeller were practical steampropelled fighting ships built. Demologos laid the foundation of the American Steam Navy, but was not followed by other vessels till after the lapse of many years. But follow they did, when another man of vision, the "father of the steam navy" came to a position where he could influence ship design -Commodore Matthew Perry designed and saw to completion the new steam powered frigates, Missouri and Mississippi built in the Brooklyn Navy Yard. It was this Missouri that crossed the Atlantic. Commodore Perry's distinctive achievement, however, was his negotiation in 1854 of the treaty between the United States and Japan, which opened Japan to the influences of western civilization. Perry sailed from Norfolk, Virginia, on the 24th of November 1852, in the "Mississippi." He reached Hong Kong on the 7th of April and on the 8th of July dropped anchor off the city of Uraga, on the western shore of Tokyo Bay with the "Susquehanna", his flagship, the "Mississippi", and the sloops-of-war "Saratoga" and "Plymouth." On the 14th of July, accompanied by his officers and escorted by a body of armed marines and sailors (in all about 300 men), he went ashore and presented to commissioners especially appointed by the shogun to receive them, President Millard Fillmore's letters to the emperor, and his own credentials. A few days later the American fleet sailed for Hong Kong with the understanding that Perry would return in the following spring to receive the emperor's reply. On the 11th of February, accordingly, he reappeared in Tokyo Bay with his fleet -- this time composed of the "Susquehanna", "Powhatan" and "Mississippi", and the sailing vessels "Vandalia", "Lexington" and "Southampton", and despite the protests of the Japanese selected an anchorage about 12 miles farther up the bay, nearly opposite the present site of Yokohama, and within about 10 miles of Edo (now Tokyo). Here, on the 31st of March 1854, was concluded the first treaty (ratified at Simoda, on the 21st of February 1855, and proclaimed on the 22nd of June following) between the United States and Japan. The more important articles of this treaty provided that the port of Simoda, in the principality of Idzu, and the port of Hakodate, in the principality of Matsmai, were constituted as ports for the reception of American ships, where they could buy such supplies as they needed; that Japanese vessels should assist American vessels driven ashore on the coasts of Japan, and that the crews of such vessels should be properly cared for at one of the two treaty ports; that shipwrecked and other American citizens in Japan should be as free as in other countries, within certain prescribed limits; that ships of the United States should be permitted to trade at the two treaty ports under temporary regulations prescribed by the Japanese, that American ships should use only the ports named, except under stress of weather, and that privileges granted to other nations thereafter must also be extended to the United States. Of course, the need for coal to heat the water in the boilers of the new steam ships required that the Great Powers acquire "coaling stations" around the globe and gave rise to new exploration and land grabs, Honolulu and Samoa being examples, as are Guam and the Philippines. The British, the Germans, the French, the Spanish and others also acquired such stations in remote locations to allow their steam-powered fleets to cover the globe- a step unnecessary in an age of wind power. And when these Great Powers had conflicts, to the winners would go the spoils, including coaling stations such as Guam. In August 1843, Missouri left the U.S. to convey a U.S. diplomat to Alexandria, Egypt. While at Gibraltar on 26 August 1843, she was accidentally set afire, exploded and sank, fortunately without loss of life. Missouri's sunken hulk was later demolished to clear the harbor. The water had been hoisted in, and the launch hauled off. Two others were alongside, filled with coal. Several Spaniards, and many of our men were in it, filling bags. One man...doing the duty of a boatswain's mate ...suddenly exclaimed, "ring the bell! ring the bell!! fire! fire!!" The fire spread, the crew abandoned ship and no human lives were lost when the ship's magazines exploded. A tame bear, a mascot of sorts, was killed. 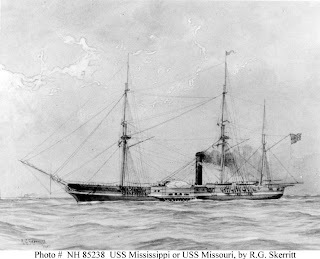 1843 - Steam frigate Missouri arrives at Gibraltar completing first trans-Atlantic crossing by a U.S. steam-powered ship. Burning at Gibraltar, 26 August 1843. 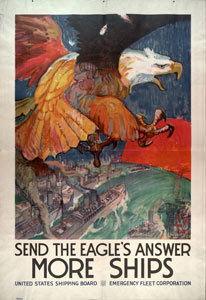 Hand-colored lithograph by T.G. Dutton, after a drawing by E. Duncan based on a "sketch made on the spot" by Lt. G.P. Mends. 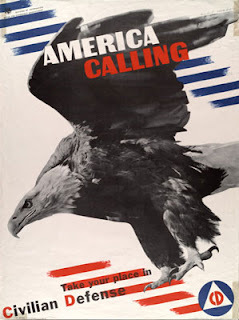 Published by Day & Haghe, Lithographer to the Queen. Another copy of this print (Photo Number NH 47227-KN, which is not colored) contains the text: "This view represents the falling of the mainmast and the explosion of the last gun, which occurred at the same moment. everybody had quitted the vessel about five minutes previous to this. On the spankerboom is an unfortunate Bear which perished in the flames." 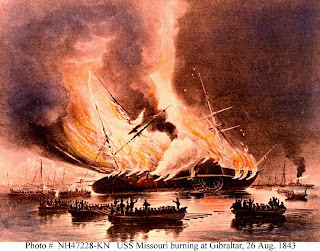 A few years since, American sub­marine divers, after repeated failures by Englishmen, removed the hull of the steam frigate Missouri, which was sunk at the mouth of the harbor of Gibraltar. Their character stands very high for marine en­gineering, and an evidence of this fact is found in their employment by the Russian government, to raise the ships which were sunk at Sevastopol during the famous siege of that city. We understand that the con­tract was made with Col. J. E. Gowan, of Boston, who achieved so much distinction at Gibraltar, and he has departed with a large corps of Americans to carry out his engage­ments with Russia. Now, offer up a salute to the brave crews of these early steam warships. Chemical weapons for the Tamil Tigers? The Sri Lankan Defence Ministry claimed on Saturday that the LTTE’s “plot to utilise chemical weapons in their future battlefields” has been tracked by intelligence sources. In a report attributed to a news website operated out of the nation, the Ministry said there was enough evidence to prove that the LTTE “already has built up stocks of cyanide and potassium during the ceasefire period”. The Ministry also said the LTTE had an underground laboratory in the Adampan area bordering Mannar-Kilinochchi districts. A suspected bomb courier for the al-Qaida-linked Abu Sayyaf group in the Philippines has been arrested, police said Friday. Gino Musa, 19, was apprehended on a Manila-bound ferry that was docked in Cebu city after bomb-sniffing dogs detected explosives — a 90mm recoilless rifle projectile and a rifle grenade — hidden inside the sack of corn and bananas Musa was carrying, said Philippine National Police intelligence director Chief Superintendent Raul Castaneda. Musa said he was unaware explosives were in the sack, which he claimed he was paid 400 pesos (US$8.50; €6.25) to take to Manila by a man he met at a port in southern Maguindanao province, Castaneda said. Police charged Musa with illegal possession of explosives, he said. Police have been on full alert for attacks by the Abu Sayyaf in the wake of a massive military operation against the group on two southern islands. Police discovered a bomb on a passenger bus in the Philippines' restive south 15 minutes before it was timed to explode and just hours after a blast in the area wounded at least 14 people, officials said Wednesday. A powerful time bomb hidden under a concrete bench exploded in a crowded square in Zamboanga city late Tuesday, wounding at least 14 people, said Zamboanga city Police Director Sr. Superintendent Manuel Barcena. The bomb, staged amid already-tight security in the city, may have been set off by the al-Qaida-linked Abu Sayyaf group to divert the military's focus from the offensives on nearby Jolo and Basilan islands, Barcena said. Later Tuesday, police found another device on a bus after its passengers disembarked at a crowded terminal in Pagadian city in nearby Zamboanga del Sur province, city police chief Oscar Buenaobra said. The bomb, hidden in a powdered milk can, was found 15 minutes before it was set to explode, and an army ordnance team defused it, Buenaobra said. The bomb was timed to explode at midnight, when the bus was scheduled to arrive at the terminal. The bus driver may have saved lives by arriving early, the police chief said. Police on Wednesday arrested a suspected Abu Sayyaf bomber on a ferry in Cebu on his way to Metro Manila with “enough explosives to kill hundreds of people,” an official said yesterday. The war against al Qaeda and its affiliates is underway in the Philippines, in case you hadn't noticed. First, Commander Salamander returns to FullBore Friday with a post on some remarkable seamanship. There is an international convention that kidnappers are never rewarded, certainly not publicly. It is known that some governments sometimes do deals with kidnappers when their citizens are seized in some far-off lawless land, but it is usually done through a third party and always denied. Even if the governments are not involved and if a company or mediators make the payment, they never say anything about it or confirm it. Such silence is vital. Otherwise the message will go out that piracy pays. But for some inexplicable reason, Denmark has ignored this extremely important convention. It is bound to encourage piracy and kidnapping. Further, Danish vessels sailing though the word’s piracy hotspots are going to become top targets. The pirates now know the ransoms will be paid if Danes are taken. That is not something Saudi Arabia can view with disinterest. The Somali coast may be a long way from Denmark where the only maritime danger come from the weather, but for vessels sailing through the Arabian Sea and Gulf of Aden to and from Saudi ports in the Red Sea, it is a major issue. They are at high risk. It is difficult to see things getting better in the foreseeable future. Although far from the whole picture, piracy certainly takes place in areas of political unrest — and there is no sign the situation in Somalia improving soon. That is worrying enough for ships putting in at Saudi ports, but if it spills over into Eritrea, as it may, and results in instability there then all of the lower Red Sea, relatively free of problems at present, could be the next major theater of piracy. That would be alarming. It cannot be ruled out: Eritrea and Ethiopia are busy conducting a proxy war in Somalia and the US is now openly hostile to Eritrea. It has just announced that it plans to add it to its list of states that sponsor terrorism. Into these murky waters, Danish officialdom has wandered with its eyes tightly shut, making matters infinitely worse with the announcement of ransoms paid. Or, as I have said before (and not too originally), "As in most things. you will get more of what you are willing to pay for." Pay pirates ransom, get more pirates. And the Danes are, by far, not the first to pay such ransoms to the Somali pirates, various merchant ship owners from the area and international fishing fleets from Korea and Taiwan have been paying off for years. In the case of the Barbary Pirates before 1815, black mail was paid to keep the pirates at bay, but it wasn't until the U.S. refused to pay and took the fight to the pirates that those pirates finally were brought to heel, see here. 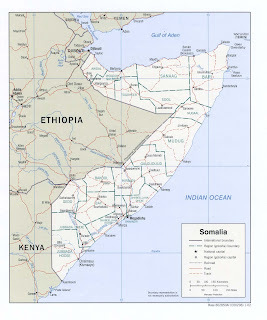 Somalia is wrapped up in a lot of trouble and taking on these tribal pirates may not be at the top of it agenda, however, the UN could authorize action against the pirates in Somali waters if the recognized Somali government would agree. In the interim, convoys,escorts and staying as far off the Somali coast as practicable is recommended. In the recent years, a new great game has begun between India and China to bring the Maldives and Sri Lanka under their respective sphere of influence in the Indian Ocean Region (I.O.R.). After Myanmar and Bangladesh, to complete the "arc of influence" in South Asia, China is determined to enhance military and economic cooperation with the Maldives and Sri Lanka. China's ambition to build a naval base at Marao in the Maldives, its recent entry into the oil exploration business in Sri Lanka, the development of port and bunker facilities at Hambantota, the strengthening military cooperation and boosting bilateral trade with Colombo, are all against Indian interests and ambitions in the region. Although China claims that its bases are only for securing energy supplies to feed its growing economy, the Chinese base in the Maldives is motivated by Beijing's determination to contain and encircle India and thereby limit the growing influence of the Indian Navy in the region. The Marao base deal was finalized after two years of negotiations, when Chinese Prime minister Zhu Rongzi visited Male' in May 2001. Once Marao comes up as the new Chinese "pearl," Beijing's power projection in the Indian Ocean would be augmented. Recently, Sri Lanka allocated an exploration block in the Mannar Basin to China for petroleum exploration. This allocation would connote a Chinese presence just a few miles from India's southern tip, thus causing strategic discomfort. In economic terms, it could also mean the end of the monopoly held by Indian oil companies in this realm, putting them into direct and stiff competition from Chinese oil companies. At Hambantota, on the southern coast of Sri Lanka where Beijing is building bunkering facilities and an oil tank farm. This infrastructure will help service hundreds of ships that traverse the sea lanes of commerce off Sri Lanka. The Chinese presence in Hambantota would be another vital element in its strategic circle already enhanced through its projects in Pakistan, Myanmar and Bangladesh. It is Sri Lanka's strategic location that has prompted Beijing to aim for a strategic relationship with Colombo. Beijing is concerned about the growing United States presence in the region as well as about increasing Indo-U.S. naval cooperation in the Indian Ocean. China looks at using the partnership with Sri Lanka to enhance its influence over strategic sea lanes of communication from Europe to East Asia and oil tanker routes from the Middle East to the Malacca Straits. China has been consolidating its access to the Indian Ocean through the Karakoram Highway and Karachi, through the China-Burma road to Burmese ports and through the Malacca Straits, especially once they have established their supremacy over the South China Sea. China's Indian Ocean policy has been clearly influenced by its ties with the other major powers. Its interest in the Indian Ocean started partly as a reaction to its perception that increasing United States presence there was aimed at encircling China. The policy has also been directly linked to its problems with New Delhi. China feels India is facilitating the American presence in the Indian Ocean region as a means of countering Beijing. Wary of China's long-term intentions and its rapidly expanding military capabilities, the US sees India as a 'natural partner' in the region and is keen to further enhance 'interoperability' with the Indian armed forces. Beijing has already expressed its anger at what it feels is an emerging quadrilateral strategic arrangement - as exemplified by the Malabar naval war games scheduled between September 4-9 in the Bay of Bengal - to ‘contain’ it in the Asia-Pacific region. In the backdrop of vitriolic protests by the Left against the Indo-US civil nuclear deal as well as the Malabar exercise, the UPA government chose to keep Admiral Keating's visit a low-profile one. But the US four-star general, who commands all American forces in Asia-Pacific, was more forthcoming. While admitting Malabar was a reflection of the "shared interests" of US, India, Japan and Australia, he said, "We want to minimise the potential areas of misunderstanding and confusion between all of us and China." "Let me emphasise there is no effort on our part or any of these other countries to isolate China or put Beijing in a closet," Admiral Keating told reporters. Up in the area where we vacation, a couple of dirt roads form part of the boundaries of the property. Last time we were there, I commented on the "washboard road" and we had some discussion about what makes the washboarding appear. 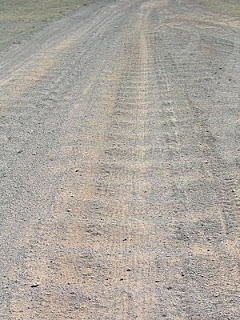 Now, a couple of scientists have a theory, which can be found at Road Bumps: Why dirt roads develop a washboard surface. Thailand to help patrol Strait of Malacca? Scuba Vandals of Saudi Arabia!